I didn’t get a nap in, like I had planned, but that’s ok. The baby slept later than usual on Saturday (we were late to swim lessons!) and the husband let me sleep in a little later yesterday. Both days of longer rest were much-needed. On Friday night, my neighbor and I went over to my mom’s house to pick blueberries. My mom has a couple of bushes that produce SO MANY berries! The limbs are so weighed down, and it looks like we barely made a dent in the crop. 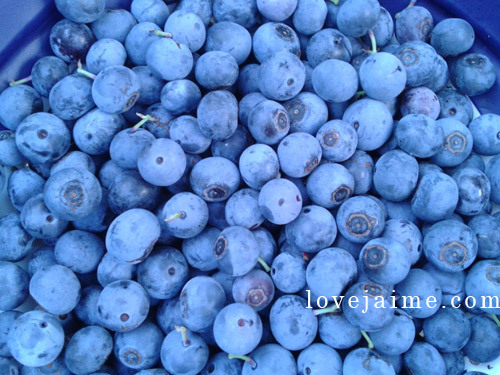 I picked an entire colander of blueberries, and my neighbor picked a pretty large basket full of berries. Now I need blueberry recipes (for something other than cobbler or pancakes.) Suggestions? Yesterday I spent time in the garden tying the tomato plants back up. The are out of control huge, and the tomato cages are not keeping them upright. So now I have more metal stakes in the garden, and they are tied to the tomato plans AND the cages. The plants are huge! There are lots of tomatoes on the plants and we’re just not-so patiently waiting for them to ripen. How was your weekend? Got a recipe you’re willing to share? 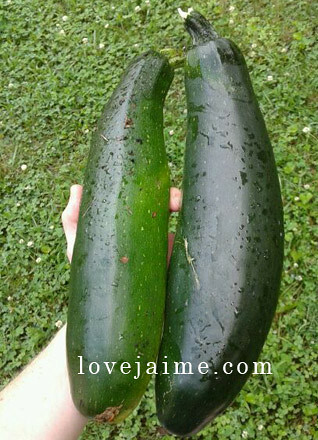 I’ll even take suggestions as to what to do with our over sized zucchini plants! no recipes to share, but blueberries freeze very easily if you want to save them for smoothies.